You accidentally deleted your WhatsApp videos and now regretting it. Well! This is really hard time since we all love to save some certain special moments in the disguise of videos. Not accidental deletion only, for some people, there are other reasons for this lost WhatsApp videos like factory reset or formatted SD card, software malfunction, virus infection or damage from water. If you are one of those who are suffering from WhatsApp videos loss and want to get them back, don't panic! There is still a chance to recover WhatsApp videos on iPhone and Android. You will get to learn how to retrieve deleted WhatsApp videos through this article whether you own an iPhone or Android device. So, let's start without any more delaying. The best way for WhatsApp video recovery when using an iPhone is to take assistance of Tenorshare UltData. It is the safest way and the most powerful way to recover your deleted WhatsApp video from an iPhone. This tool can support not just videos but more than 20 types of files including SMS, photos, videos, contacts and so on. The most amazing thing about Ultdata is it can help you in recovering your deleted data even if you don't have backup. This means, you can recover data directly from iOS device. Also, you can recover from either iCloud backup or iTunes backup. Here are the guides to get your videos back through Tenorshare Ultdata. Step 1 – Make sure to download the correct version of Ultdata in your PC and install it later. Now, open it to begin and connect your iOS device to the PC using a USB cable. There will be tabs available on the navigation bar at the top. You will by default, get to the 'Recover from iOS Device' mode. Now, let the device gets scanned and proceed. Step 2 – On successful detection of the device, the program will display you a screen where the data types will be appearing. Here, you can click on 'WhatsApp & Attachments' in order to proceed for WhatsApp video recovery. Hit on 'Start Scan' afterwards. Step 3 – When your selected data will be scanned, you can easily preview them on the resultant screen. When you are done with previewing, click on the 'Recover' button and decide whether you want to recover WhatsApp videos in your device or PC. Step 1 – Launch the program once it's installed. Now, you need to select the mode on yourself. 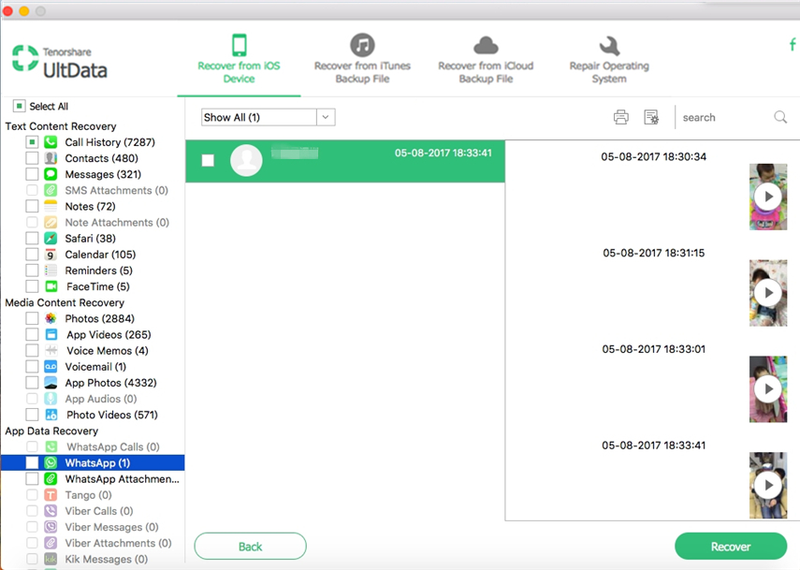 Choose 'Recover from iTunes Backup File' or 'Recover from iCloud backup File' to recover from iTunes or iCloud backup respectively. Step 2: For iCloud: You will need to sign in to your iCloud account to get the backup files. When you see the list of backup files, pick out the one that has videos and click 'Next'. Now, choose the data type i.e. WhatsApp. Hit on 'Next' and the selected file will be scanned and downloaded. Preview it and then click 'Recover' to get the videos back. For iTunes: All the backup files will be listed on the screen after you choose the corresponding tab. Choose the correct backup that has your videos and click on 'Start Scan'. After the file gets scanned, preview your WhatsApp videos by choosing it from the left panel on the resultant window. Click on 'Recover' at the end. Many of you might not know that WhatsApp has the power to automatically save you chat history thereby creating backup which is also called auto-backup by the people. Hence, you need not to worry if your WhatsApp videos have been erased accidentally. This auto backup recovery process is surely going to help you. Before you start wondering, how you can do this, here are the steps to execute this method. Step 1 – First of all, you are required to uninstall your WhatsApp from your device. Step 2 – Now, install it again from the Play Store and launch it. Step 3 – Enter the necessary details to login. Make sure to verify the same number that was earlier in your WhatsApp. Step 4 – After when you complete WhatsApp setup, you will find an option for restoring your chats. Just hit on 'Restore' and your chats along with the videos and photos will be back to you in a while. So, we are done with recovering WhatsApp videos on iPhone and Android devices. You can now recover your videos on your own without the need of any technical expert. So, the next time, when any of your videos get deleted by any means, you don't need to get worried because now you have idea what you need to do. We hope you like our efforts and start recovering your deleted videos with the method mentioned above. If you have any doubt regarding this or anything about your iOS/Android device, you can interact with us by sending your comments below. We would be glad to give you assistance wherever possible.